Judy McArthur (Sweetwater Kennels) picked me up at 9:00 am with her truck loaded up with four female Kuvasz puppies of 4-months old, and we headed off to meet Jean, an Alpaca farmer. Judy and I were both very excited to get to see some Alpacas and we were both beaming with the thought of the Kuvasz breed having a larger presence in the Alpaca world, as we are both avid lovers and promoters of this amazing breed. Once we arrived, we pulled up to the barn, and after introductions, we unloaded the pups and let them loose in the Alpaca barn, which connects to a large field of older male alpacas (and one llama). After a few minutes of the puppies running around and exploring, Jean brought Mayo, her first Kuvasz, out on a leash to join us and the puppies. After the initial “Alpha dog/strange puppies” shock, Mayo was let off her leash and she graciously allowed the four puppies to follow her around and explore her territory and even she played with them. We then wandered into the part of the field that the alpacas were in and watched as the Kuvasz’s natural instincts began to click in the little puppies’ minds in this new exciting environment. Judy and I, as breeders, and Jean, as a livestock owner, then analyzed the different behaviours of the individual puppies. Judy pointed out that one puppy (affectionately named “Curly” because of her curly coat) was her pick for Jean because she was a bigger size and had settled in very quickly with Mayo and Jean’s livestock and property. This particular puppy was very independent and not afraid to venture off to get a drink of water or greet an Alpaca standing near, by herself. She also clearly respected and trusted Mayo. 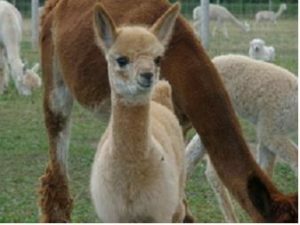 After a while in the field, another Alpaca owner arrived, Genie Reaume from Beneath the Sun Alpacas, from the Niagara region. She saw the puppies and, of course, fell in love too, but she was unsure if she wanted a puppy at the moment. We stayed out in the field a bit more, and continued to observe the puppies. We saw Mayo in action as she protected the puppies from any Alpaca she thought got too close, and even watched as she sped off to the far top corner of the field once, when a truck had stopped on the side of the road. She waited for the truck to start up, then ran beside the fence line, until she was satisfied that it was moving along. Jean selected the curly puppy for herself, and after a few phone calls Genie selected the “lanky” girl for herself. We headed to the house to do paperwork and enjoy warm brownies and tea/coffee over conversation about Kuvasz and Alpacas. Judy and I felt some of the products made from Alpaca yarn, and we were so surprised to discover that it is one of the softest, warmest, and nicest materials to make pieces of clothing out of. 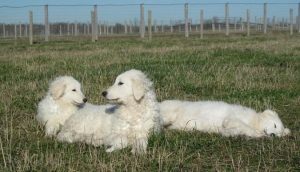 We were very happy to place a total of three puppies -the third with Yvette and Noel (Camelot Farms Alpacas)- that day within the Alpaca community, and we are thrilled to see the Kuvasz in working homes that are quite perfect for this breed’s amazing talents.